PETALING JAYA: The property market looks pretty strong this year partly because access to financing is still “relatively good”, said Bolton Bhd executive chairman Datuk Azman Yahya. Datuk Azman Yahya (right) posing with Bolton Bhd executive director Chan Wing Kwong at the newly launched Bolton Studio. He said the company planned to launch three big projects this year. The company aims for RM500mil sales in the financial year ended March 31, 2011. Bolton recorded revenue of RM257.5mil for FY10. “We have seen unprecedented demand for our properties; even the projects we haven’t launched,” Azman told StarBiz after the launch of Bolton Studio yesterday. Bolton has said it planned to launch a mix residential, retail and commercial projects worth about RM1bil this year. “Profit growth will be reasonably strong compared with last year as things are looking pretty rosy for the time being,” Azman said. On its newly-launched sales gallery Bolton Studio, Azman said the company hoped to provide its customers additional convenience by having a property showcase under one roof. “We plan to replicate this sales gallery concept at our township development of Taman Tasik Prima Puchong. Even as we speak, the finishing touches are being put to Bolton Studio Taman Tasik Prima which is expected to be opened by the end of the month,” he said. He said due to the gallery’s easy accessibility from Kuala Lumpur, Subang Jaya and Shah Alam via well-connected highways, it had since its April opening attracted many curious passer-bys which had resulted in positive sales enquiries. With a built-up area of about 8,000 sq ft, the gallery features scale models of Bolton’s latest high-end developments of sixceylon, 51 Gurney and Arata. Each scale model is equipped with a touch screen terminal whereby users can browse and experience a 3-dimension walk-through and find out more information about the respective developments. Bolton Studio also showcases a live show unit of sixceylon, a 33-storey condominium in Bukit Ceylon featuring 215 units. The 696 sq ft fully-furnished show unit provides customers with a functional idea on ways to optimise small-sized units to their full potential. PROPERTY developer Rahsia Estates Sdn Bhd, a subsidiary of Riverbank Suites Sdn Bhd, has chosen Langkawi for its newest project called Rahsia Estates Residences & Spa Langkawi. Group Chief Executive Officer Hanizah Tun Abdul Hamid said the gross development value would be approximately RM250 million while the total cost RM180 million. "It will be parceled into four different precints with various types of resort properties comprising a niche boutique-style hotel offering 18 luxury villas, a five-star hotel complex with 110 club suites, and 31 cabana villas positioned as prime residential choices," she said. She told this to reporters after the Memorandum of Agreement (MOA) signing ceremony between Rahsia Estates and Asian Finance Bank Bhd (AFB) here Friday. The MOA between AFB and Rahsia Estates is a strategic partnership whereby the bank will be introducing the property to local and international investors interested in high-profile properties in prime locations. AFB, a full-fledged Islamic bank, is backed by Qatar Islamic Bank, RUSD Investment Bank Inc of Saudi Arabia and Global Investment House of Kuwait. Present at the event were Deputy Tourism Minister Datuk Dr James Dawos Mamit and AFB Chief Executive Officer Datuk Mohamed Azahari Kamil. The resort, sprawled across 6.9 hectares of undulating land facing the Andaman Sea and Pulau Dayang Bunting, was set to be Langkawi's first niche mixed residential and commercial development, Hanizah said. "The development will abide and follow the guidelines as laid out by the Green Building Index once operational by the year 2014. "It stands to become one of Langkawi's award-winning landmarks, offering luxurious accomodation, and top-rated customer services within a gated community and security service. "As the economic climate is on a recovery trend, Rahsia Estates notes the demand for such a mixed-property development project. This will appeal to discerning tourists who enjoy a certain lifestyle, as well as second home-buyers wishing to set up home base and live in the island, particularly, those who are participating in the Malaysia-My-Second-Home programme," she said. Meanwhile, Azahari said he had confidence in Rahsia Estates' resort project in Langkawi eventhough the property market was currently "soft". "The company has secured one of the best locations on the island that stands to ensure the development's successful completion and visitors' satisfaction. "The bank believes that property transactions will start to move upwards in the near future since there are positive signs of recovery," he said. He said Rahsia Estates Residences & Spa Langkawi would become the most attractive and rare property jewel to be acknowledged as one of the nation's luxurious property resorts and one of the iconic resorts of Langkawi. "The bank's strategy is to market the property to its Middle Eastern network to take advantage of the potential of this exquisite property development in the region," he said. The bank had already identified potential buyers from the Middle East, he added. The Sungai Besi airport in Kuala Lumpur will be developed into a green mixed-use development, which will feature a commercial hub. Defence Minister Datuk Seri Ahmad Zahid Hamidi said the new development area will be known as "City of Malaysia" and will be jointly developed by Middle Eastern investors including the Qatar Investment Authority and 1Malaysia Development Bhd. "We have decided to move the Royal Malaysian Air Force (RMAF) airbase now occupying the land to another area, which will be announced by the Prime Minister at a later date. We are not sure when the move will take place yet. But they will be moving lock, stock and barrel to a new location," he told a press conference after presenting the 50 keys to new homeowners by the Lembaga Tabung Angkatan Tentera (LTAT) in Bukit Jalil, Kuala Lumpur yesterday. He added that LTAT will not have any stake in the new commercial development that is to take place at the Sungai Besi airport. "We are also not sure when they (LTAT) are going to move out. All these things are being ironed out. 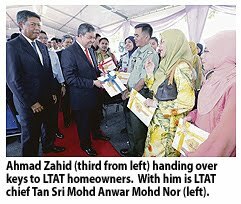 But moving is not a problem because LTAT has enough landbank for relocation," Ahmad Zahid said. He said the 460ha land is owned by the federal government through an entity know as "Perusahaan Tanah Persekutuan". Meanwhile, Ahmad Zahid said delivery of the Airbus A400M has been delayed to 2015. Malaysia had placed its order in 2005 for the four planes originally due to be delivered in 2013. "Because they will be delivered at a later date, we are allowed to defer our payment. If not, the progressed payment was supposed to start this year," he added. PROPERTY developer UEM Land Holdings Bhd wants to expand its landbank beyond Nusajaya in Johor to include places like the Klang Valley and Penang to provide a steady income stream. The company has RM250 million to spend after it exercised its rights issue in April, which saw RM970 million being raised. Part of the proceeds from the exercise were used to repay debt and for working capital. 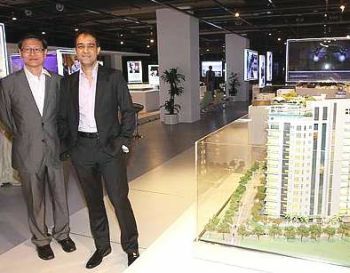 UEM Land plans to launch its maiden project outside Nusajaya in Cyberjaya, Selangor, by the end of this month. Dubbed "Symphony Hill", the 39.7ha development, with a gross development value of RM1.1 billion, will be developed in at least six phases over the next 10 years. "We will develop according to market demand. If there is more demand, we might not need to wait until six phases," said managing director Datuk Wan Abdullah Wan Ibrahim after the company's annual general meeting in Kuala Lumpur yesterday. UEM Land is in talks with certain parties to develop land in the Klang Valley, but has yet to finalise anything. "We want to make UEM Land a national player in the property market and for this to happen, the company must have activities and exposure outside of Nusajaya," he said. UEM Land is the developer of Nusajaya's main features such as the state administration complexes of Kota Iskandar, Puteri Harbour, Southern Industrial and Logistics Clusters and Alfiat Healthpark and residences. The company has 3,400ha of undeveloped land in Nusajaya, which is targeted to be developed by 2025. For its financial year ended December 31 2009, it posted a 54 per cent jump in net profit to RM115.6 million on revenue of RM403.1 million. MALAYSIA has identified 52 high-impact projects worth RM63 billion to be carried out by public-private partnerships under the 10th Malaysia Plan (10MP). The projects, which include the building of highways and power plants, are expected to drive the economic transformation agenda. "This new wave of public-private partnership (PPP) will ensure equitable sharing of risks and returns," Prime Minister Datuk Seri Najib Razak said in his speech during the tabling of the 10MP in Parliament yesterday. The projects include seven highways at an estimated cost of RM19 billion. Among them are the West Coast Expressway, Guthrie-Damansara Expressway, Sungai Juru Expressway and Paroi-Senawang-KLIA Expressway. Companies seen benefiting from these highway projects include Gamuda Bhd, IJM Corp Bhd, WCT Bhd and Mudajaya Bhd. Other projects include two coal-powered electricity plants that cost an estimated RM7 billion and development of the Malaysian Rubber Board's land in Sungai Buloh, Selangor, at a cost of about RM10 billion. The land is about 1,337ha. Najib said the private sector will also get the chance to take part in major projects led by government-linked companies, such as the redevelopment by 1Malaysia Development Bhd of the Sungai Besi Airport area and a new international financial district in Kuala Lumpur. Other projects include construction of a liquefied natural gas regasification plant by Petroliam Nasional Bhd in Malacca (about RM3 billion) and two aluminium smelters in the Sarawak Corridor of Renewable Energy (about RM18 billion). Analysts said they had expected more big projects to be announced under the PPP, but felt that it was nevertheless a good start. The value of the projects is three times more than the RM20 billion Private Finance Initiative scheme under the 9MP, they noted. The analysts said that the main concern now was funding and execution and, in some cases, tariff. Many felt that it was important for the government to ensure that the projects roll out within the stipulated five-year time-frame and did not encounter delays once the deadlines were set. "Many of the foreign investors I spoke to today were sceptical as to whether some of these projects would actually happen, seeing as some under the 9MP were not carried out.
" If they do happen, however, it would be great for the construction sector, and the government would benefit as well," said a construction analyst from a foreign research firm, who declined to be named.